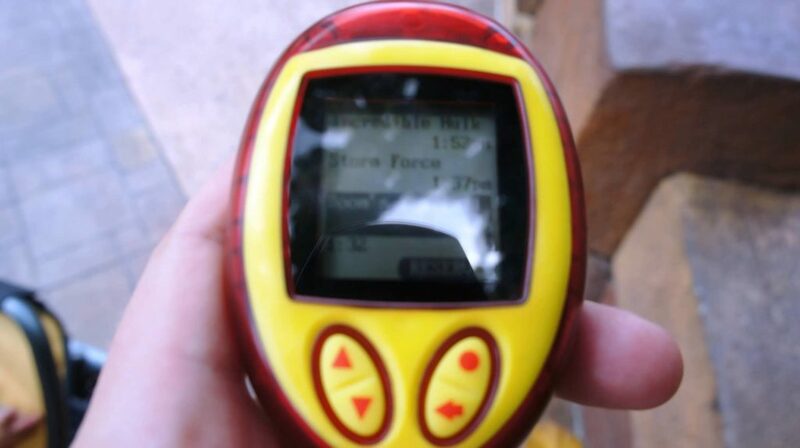 Universal Orlando Resort guests who wished to minimize their wait times used to have a less-expensive alternative to purchasing Express Passes: called the Universal Ride Reservation System (or Q-Bot for short, after the interactive pager it utilized), it assisted with managing queue times by allowing visitors to create virtual placeholders in line. We say “used to” because, well, this reservation system had slowly dwindled over the years, until it was finally sent to a quiet and peaceful death (hence its current placement in our Prop Graveyard). We’re keeping this guide page up, however, for posterity’s sake – interestingly enough, the details contained here weren’t available on any other source, including Universal Orlando’s own website. 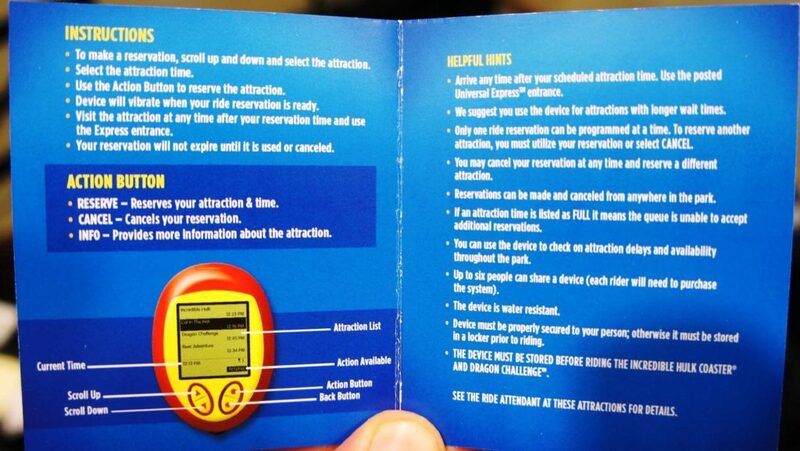 This historical page includes complete documentation on how the Universal Ride Reservation System was used and advice to help past visitors decide if it was a good value for their families. Please note that Q-Bot was available at either Universal Studios Florida or Islands of Adventure; this page may only include documentation from the latter, but it was identical at both parks (and there never was a one-day, two-park version, just for the record). 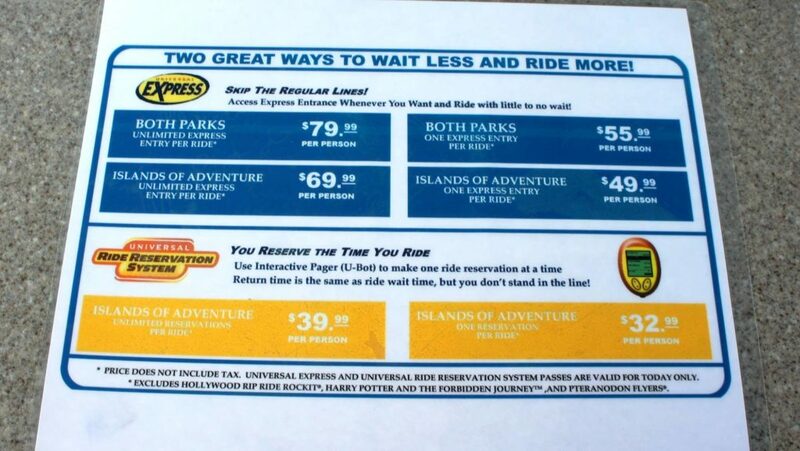 On the top half of the sheet, you see that day’s prices for Express Passes (visit our complete guide to Universal Express Passes for more information), and on the bottom half, you see the prices for the reservation system. Right away, you will notice that there are two versions of Q-Bot available: the less expensive price is for “one reservation only per attraction,” and the more expensive one is for “unlimited” reservations – we will explain the differences between these two options a little later. You will also see that both options were less expensive than Express Passes, which brings us to our first major point: the Q-bot system was an alternative to Universal Express Passes; it didn’t replace them by any means. If you were already getting Express access – such as, say, by staying at select on-site hotels – you had no need for the Ride Reservation System. What rides used the system? It could have been used for any ride that accepted Express Passes (see the list), but not for shows, such as the Horror Make-Up Show. Did the Q-Bot prices change from day to day, like Express Passes still do? Yes, they did. The Ride Reservation System was always less expensive than Express Passes for any given day – but, yes, the busier the parks were, the more you had to pay to use the system. 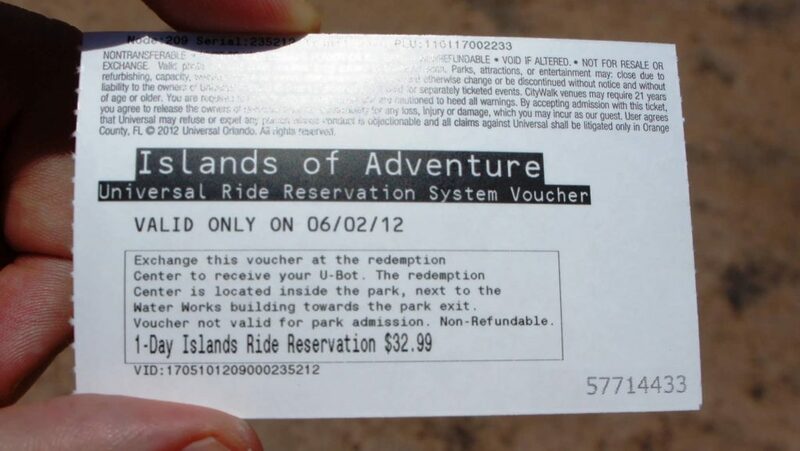 A good rule of thumb is that the Q-Bot system was about $10 to $20 less than the basic Express Pass pricing. Did the Q-Bots sell out? Yes, like Express Passes, it was possible (though rare) for Q-bots to have sold out. How did pricing work for multiple people in a party? 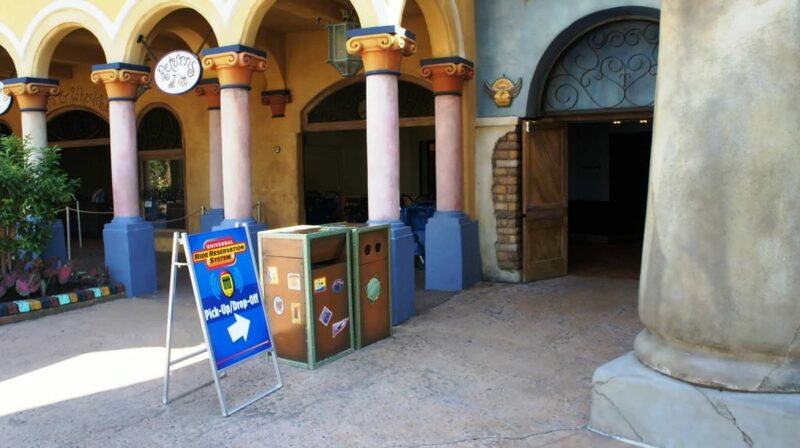 Universal Studios Florida used similar signs. To pick up your Q-Bot, Universal asked you to sign a contract stating that, if you failed to return the pager at the end of the day, you would have been charged $50. After that, you would have been asked for a credit card to use – not for a deposit, but to copy your information so that, should you have decided to keep the unit (or if you broke it), the company could have then charged your card. As we mentioned above, you could have gotten a separate Q-Bot for each person in your party, if you wished. However, if you did so, you would have needed to sign a separate contract for each unit (and, of course, you would have been responsible for each one, as well). If you would have preferred to use just one Q-Bot, you could have assigned up to six people on it – but everyone would’ve then had to stay together in one group throughout the day. When the screen was on, you would have seen a list of participating rides. Also, the current wait time and the number of guests assigned to the unit were displayed at the bottom of the screen. Under each eligible attraction, there was a separate time listed – this was the time you could have reserved for that ride. It is very important to understand that the reservation time listed was simply the current time plus the ride’s current wait time. That is probably a little confusing, so let me explain: using the Q-Bot system did not get you onto rides any faster (or more slowly) than you would otherwise have waited in the standby lines. 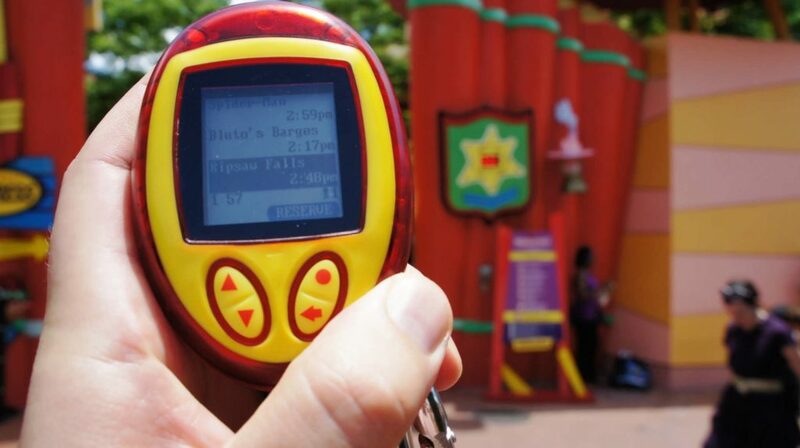 For example, if the current time was 1:00 pm and the current wait time for Dudley Do-Right’s Ripsaw Falls was 60 minutes, the ride reservation time displayed on the pager would have been 2:00 pm. Likewise, if the current time was 1:00 pm and there was a 15-minute wait for Doctor Doom’s Fearfall, the ride reservation time available would have been 1:15 pm. When your ride reservation time came around, the unit vibrated and displayed a message telling you that you could ride now! 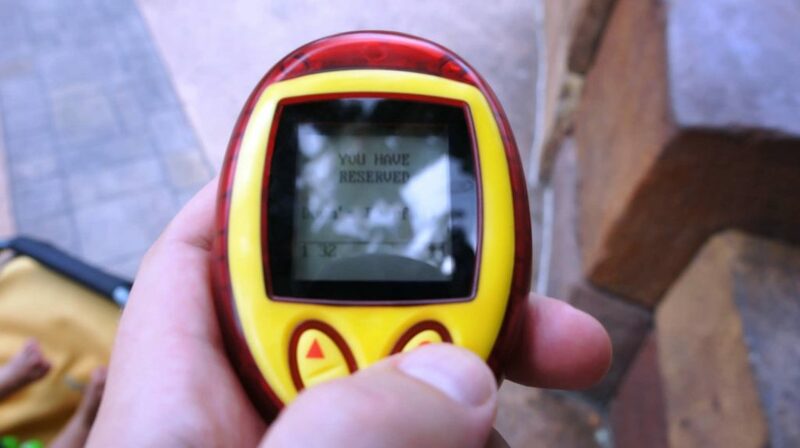 The final step was to take the Q-Bot to the Express Pass entrance of the attraction, show it to the attendant (who would scan your reservation on his own Q-Bot unit), and then be ready to ride. Did I have to be on-time? Nope. You could have gotten on a ride using the Express Pass line at your reserved time or any time thereafter. Could I have canceled a reservation? Yes, you could’ve. When a ride time was reserved on the unit, an option to cancel was also available, and it could have been done in a click or two. Could I have shared the Q-Bot? Yes, you could’ve. For ride reservation purposes, the Q-Bot wasn’t actually assigned to a specific person – or, at least, it wasn’t assigned in any way that a ride attendant could have checked. 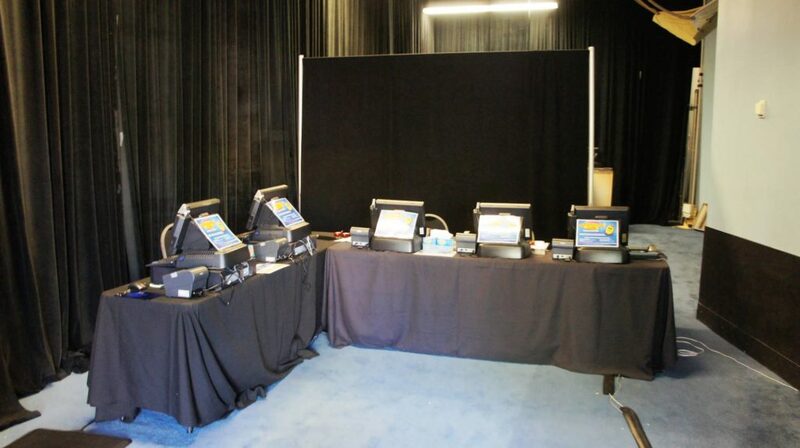 So it was very possible to have purchased access for one person and then pass the unit among different people throughout the day. However, this really wouldn’t have been an effective way to use the system, as we will see. Did the Q-Bot have to be stowed on the big coasters? As you may already know, you cannot bring any loose articles on The Incredible Hulk Coaster, Hollywood Rip Ride Rockit, and the like. Well, the same went for the Q-Bot. When you used the system for these rides, you first had to approach the ride attendant as usual – but, instead of being let in the Express Pass line immediately, you were given a return ticket so you could have gone to the free lockers, stowed the pager and your other loose articles, and then returned to the Express line. No, it was only water-resistant, so guests had to stow it in a dry place on the water rides. How many ride reservations could I have had at once? You could have only one reservation at any given time, though you could’ve canceled and re-booked reservations as much as you wanted to. That means that, once you had a reservation, you had to either cancel it or go on the ride before another reservation could’ve been selected – even if your ride time had passed and you had yet to hop on that attraction. As we mentioned at the top of the page, there were two versions of Universal’s Ride Reservation System available: limited or unlimited. 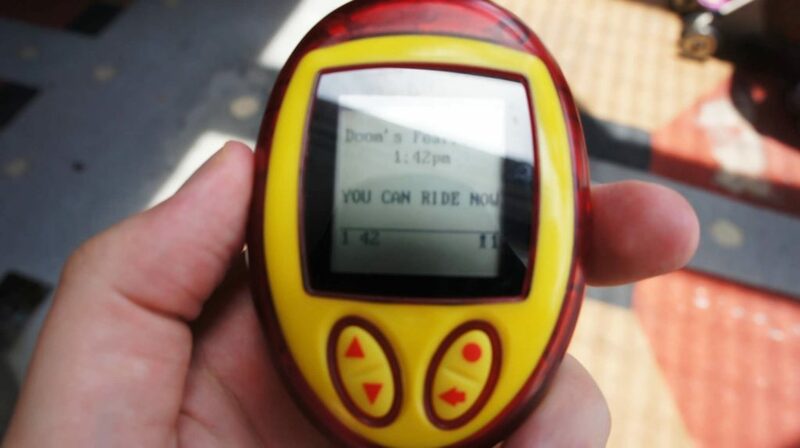 When you purchased the limited version, you were able to use the Q-Bot one time for each participating ride; once you had used it for a specific ride, it would will no longer appear on the list. When you purchase the unlimited version, all participating rides will always be available for reservations (unless, of course, they break down, etc.). No matter which version you used – and this is your friendly reminder once again – you could only have one reservation at a time. Was the Universal Ride Reservation system worth it? But was it worth it? This simply came down to how much you valued not having to stand in line. Just as with Express Passes, we recommended that you check out our Universal crowd calendar and attraction wait times based on crowd levels pages to see what you were up against during your visit. Was it worth $30 to $50 per person not to be in lines for two to four hours during your day? For some people, the answer was yes; for others, perhaps not. Either way, keep in mind – and this is true still to this day – much of the time you aren’t in line, you are usually spending money on food or merchandise. So the effective price of the Q-Bot may actually have been quite a bit higher than the purchase price was (this is why Disney’s FastPass system is free). This one was totally up to your budget. As always, the very first thing to understand is whether you even needed a “skipping the regular lines” system. When crowds are low to moderate, most people don’t see the value; when it’s busy, however, there can be considerable value – then it really comes down to how much you want to spend. If Express Passes fit in your budget, get ‘em, just because you get to decide when you want to go on rides. On the other hand, if you didn’t have $80 per person to spend on Express Passes, but still didn’t want to spend six hours in lines, then you should have picked up a Q-Bot.